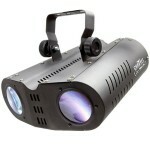 This small but effective package is about as simple and affordable as it gets, offering an array of preset lighting effects in a simple package for a small dance floor. 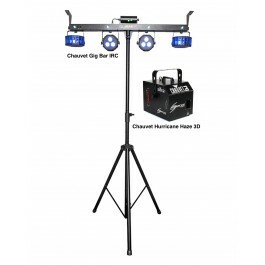 Chauvet Gig Bar IRC: 4-in-1 light that includes a pair of LED derbies, a pair of LED Pars, a laser, and strobe effect all mounted on one bar. Phenomenal built-in automated and sound-activated programs that include all 4 effects to make one complete show! Chauvet Hurricane Haze 3D: A water-based haze machine with a 2.5-liter (0.7 gallon) tank and takes only four minutes to heat up to create a subtle atmosphere, enhancing any light show. It features a low-fluid indicator and automatic shutdown. A wired, timer remote (HC-T) is also included.